Department of Management, University of North Florida, Jacksonville, USA. Received May 22nd, 2011; revised July 12th, 2011; accepted August 25th, 2011. US companies are described based on fieldwork. In both cases, managerial efforts were made to quell gossip. 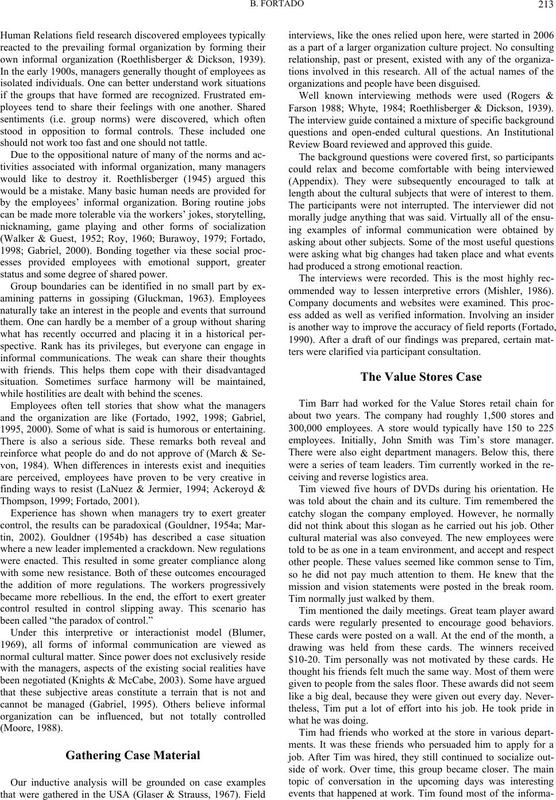 certain aspects of informal employee organization were more functional than some of the formal practices were . tion (Noon & Delbridge, 1993). on two case studies from the USA. Two Views: Cultural Matter or Antimatter? (Bordia, et al., 2006: p. 617). favor of self control and peer discipline (Barker, 1999). “no” based on stock reasons (Izraeli & Jick, 1986). image and producing as high a level of performance as possible. evils (Danziger, 1988; Greengard, 2001; Burke & Wise, 2003). The rival normal cultural matter view also has a long history. own informal organization (Roethlisberger & Dickson, 1939). should not work too fast and one should not tattle. status and some degree of shared power. while hostilities are dealt with behind the scenes. 1995, 2000). Some of what is said is humorous or entertaining. organizations and people have been disguised. Farson 1988; Whyte, 1984; Roethlisberger & Dickson, 1939). Review Board reviewed and approved this guide. length about the cultural subjects that were of interest to them. had produced a strong emotional reaction. ommended way to lessen interpretive errors (Mishler, 1986). ters were clarified via participant consultation. employees. Initially, John Smith was Tim’s store manager. ceiving and reverse logistics area. mission and vision statements were posted in the break room. Tim normally just walked by them. cards were regularly presented to encourage good behaviors. tion he obtained via the grapevine to be accurate. manager of the back of the store, was left in charge that evening. off their clothes. Photos of them were taken. In the days that followed, Mary Mooney saw the pictures. time. The group involved was thereby completely broken up. from. This meant the store had entirely new leadership. had allegedly taken her clothes off. details emerged as Tim heard different accounts of the evening. her subordinates 24/7 (i.e. 24 hours a day, seven days a week). ceiving. This was in keeping with the formal job descriptions. was no one else in this store to ask questions about receiving. operation less vulnerable if one of the two left. duced positive financial results each year for over 15 years. via their work assignment or the grapevine. also pushed to do more work. when a team was moved to the supervision of a new director. business, cut out unnecessary bureaucracy, and reduce costs. Some of the changes made were not entirely well received. much money and felt the process had gone too far. downward, so only draft quality documents were produced. be useful. Frequent printer adjustments were now necessary. might not be an alternative use for the remaining cartridges. objective became to provide average levels of compensation. former” if one got the same raise or a very little additional raise. The average raise in this area at the time was 3%. given. A car wash was also provided. would be allowed to choose an item from a big box of toys. Star Wa r s f igures, an d laptop bags. award winners on a dinner cruise to a city 30 minutes away. others, like the l awn chair . als and they applied for them. probably never be able to shake it. articles generated even more gossip about these matters. notice of employment decisions, such as layoffs, from the press. small, she was proud to have won this competition. matter, betting pools were officially condemned. not assumed innocent until proven guilty. ally provided. O vereating could easily result. one of the top ten places for women and minorities to work. to learn what to do and not do via the grapevine. interview, but no subsequent feedback was typically provided. One had to learn how to fend for oneself. was critical that one provide deliverables by a known deadline. get her way. She concluded the discussion by saying “OK. in the Navy together. Some had also worked together at a bank. was very real to many Insuro women. promoted one day. He stressed the importance of networking. informed, he arranged for her to attend managerial meetings. quently would suddenly stop talking. and practices were being either overtly or covertly challenged. 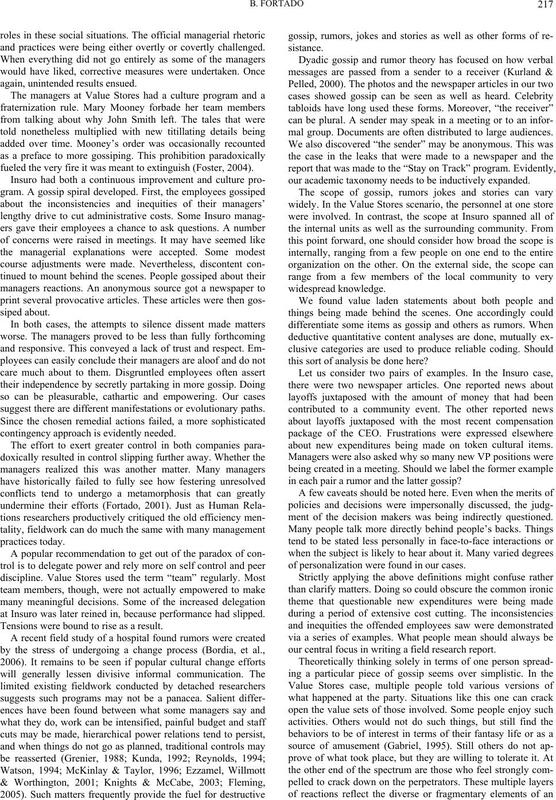 fueled the very fire it was meant to extinguish (Foster, 2004). suggest there are different manifestations or evolutionary paths. contingency appr oac h is evidently needed. at Insuro was later reined in, because performance had slipped. Tensions were bound to rise as a result. mal group. Documents are often distributed to large audiences. our academic taxonomy needs to be inductively expanded. this sort of analysis be done here? about new expenditures being made on token cultural items. in each pair a rumor and the latter gossip? ment of the decision makers was being indirectly questioned. of personalization were found in our cases. our central focus in writing a field research report. sized employees, or some group of the remaining employees? network? No perspective is objective or neutral. and whose voice is left out. full and proper social context in theory, research or practice. advised to blindly attack the employees’ informal organization. programmed or obedient thralls. They have minds of their own. jokes, and stories, the future can still be positively influenced. sharing power and making less money. and contradict one another (Dalton, 1959). making a change, some ongoing observation would take place. Adjustments would then be made as needed. for it should also be considered. schism could be explained by these positional differences. grapevine to create useful false impressions (Fortado, 1994). an objective answer appears to be a moot point. and, if need be, what can now be done to improve upon matters. Ackeroyd, S., & Thompson, P. (1999). Organizational misbehaviour. concertive control. Thousand Oaks, CA: Sage. Blumer, H. (1969). Symbolic interactionism: Perspective and method. Englewood Cliffs, NJ: Prentice- Ha ll. Bordia, P., Jones, E., Gallois, C., Callan, V. J., & Difonzo, N. (2006). change. 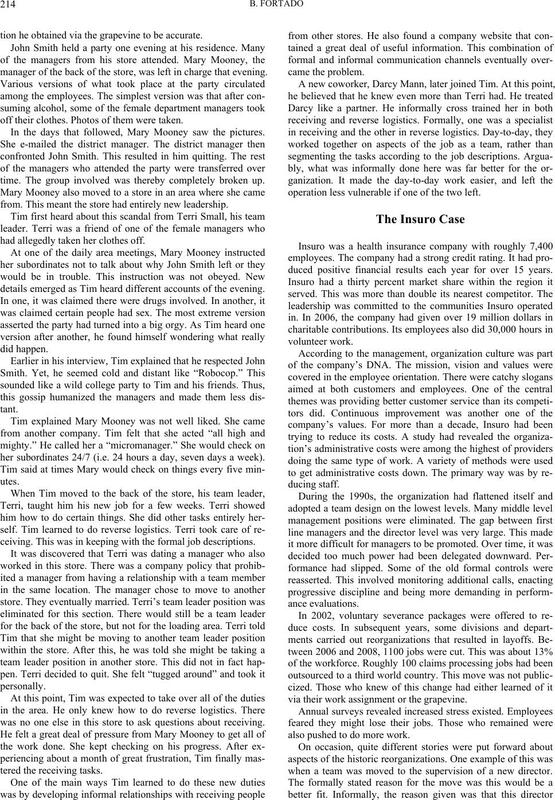 Group and Organization Management, 31, 601-621.
pruning of the office grapevine. Business Horizons, 46, 71-76.
approach. Glenview, IL: Scott Foresman. Dalton, M. (1959). Men who manage. New York: Wiley. Fortado, B. (1990). T he responsibilities of a semi-structured interviewer. 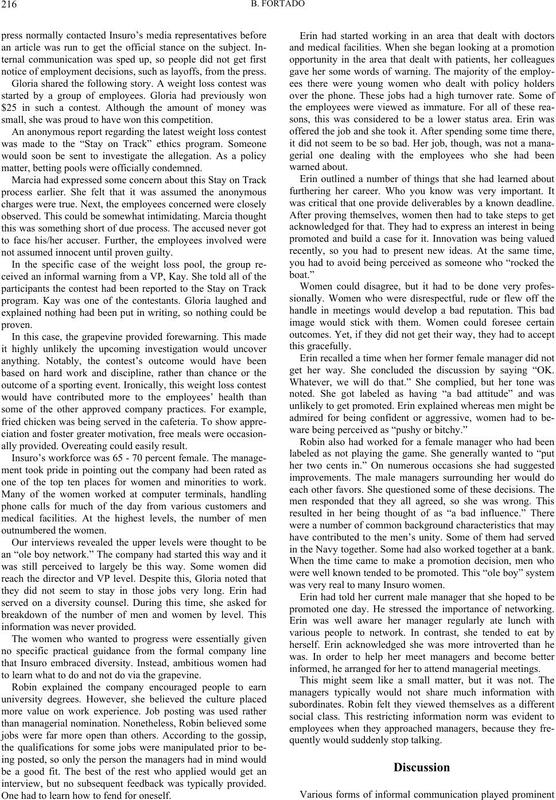 Employee Responsibilities an d R i g h t s Journal, 3, 31-46. Peering into the subcultural chasm. Human Relations, 45, 1141-1167. Fortado, B. (1994). Informal supervisory social control strategies. Journal of Management Studies, 31, 252-274. Fortado, B. (1998). Interpreting nicknames: A micropolitical portal. 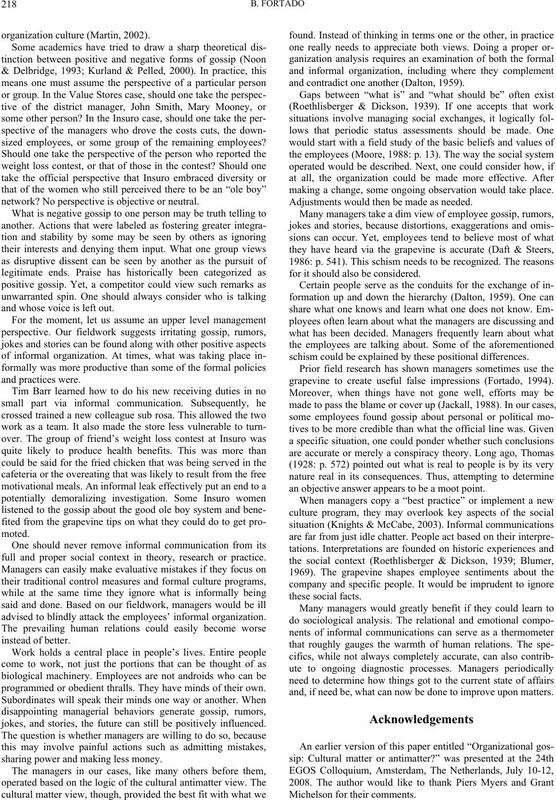 Journal of Management Studies, 35, 13-34.
future directions. Rev i e w o f General Psychology, 8, 78-99.
subjectivity. Organ ization S tudies, 16, 477- 501.
fantasies. New York, NY: Oxford University Press. ment relationships. New York, NY: Harper & Row. power expansion: a case stud y . 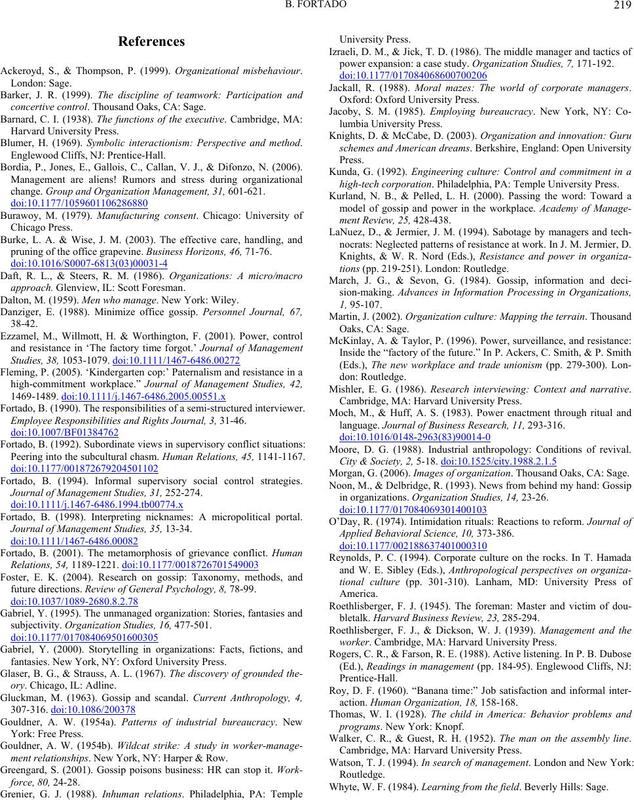 Organization Studies, 7, 171-192. Jackall, R. (1988). Moral mazes: The world of corporate managers. high-tech corporation. Philadelphia, PA: Temple University Press. nocrats: Neglected patterns of resistance at work. In J. M. Jermier, D.
tions (pp. 219-251). London: Routledge. Mishler, E. G. (1986). Research interviewing: Context and narrative. language. Journal of B usines s Research, 11, 293-316. Moore, D. G. (1988). Industrial anthropology: Conditions of revival. Morgan, G. (2006). Images of organization. Th ou sa nd Oaks, CA: Sage. in organizations. Organization Studies, 14, 23-26. Applied Behavioral Sci en ce , 10, 373-386.
bletalk. 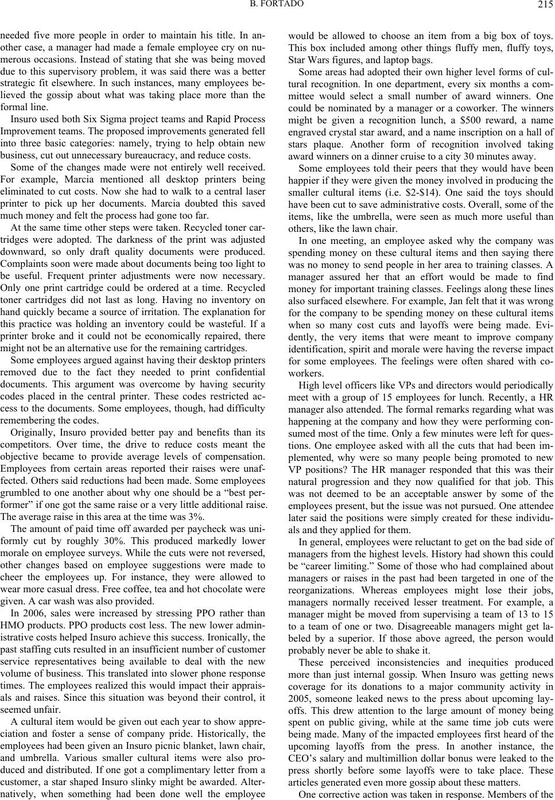 Harvard Busines s Review, 23, 285-294.
worker. Cambridge, MA: Harvard University Press. action. Human Organization, 18, 158-168. Walker, C. R., & Guest, R. H. (1952). The man on the assembly line. Whyte, W. F. (1984). Learning from the fie ld. Beverly Hills: Sage. you heard of this term? How does your organization define it? definitions? What are your thoughts on organization culture? When does your workday start? Do you have any breaks? or are they largely left on their own to get the job done? tion? Could you gi v e me some examples? handle the situation? Could you give me some examples? tion? Could you g i v e me some examples? other workers; or other means) Are you kept well informed? you give me some examples? Have there been any rumors? about what is going to happen before it is formally announced? Could you give me any examples? How often do you have meetings? Who do you meet with? Does the organization have any ceremonies and rituals? (e.g. Do you know much about the history of the organization? Do people tell jokes about things that have happened at work? examples? Where did that come from? What is that person like? proved? What is the best thing that has happened at work? What is the worst thing that has happened? could explain wha t l e d you to that conclu s i on?